Where are you spending money on for employee wellness program? Rolling out gym memberships? Giving out healthcare packages? Or some on-site health campaigns? How about an employee wellness app which solves this problem with being cost-effective at the same time? 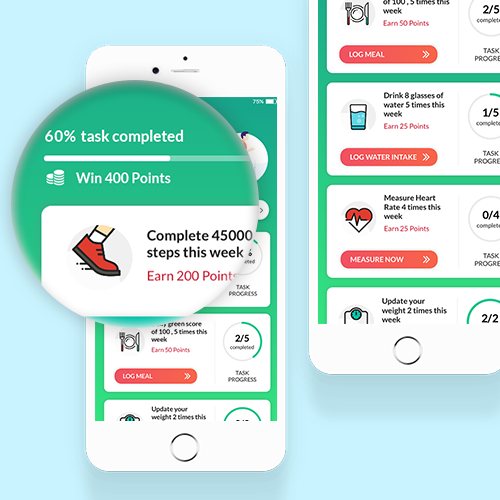 An app which lets you track your employees’ health, promotes engagement and offer incentives at the same time. Healthcare and wellness programs have become an important aspect of the present day corporate industry. Why am I saying so? The corporate world has grown more competitive over the past few years. Employees’ are now dedicating more hours into their work without a thought for their own self. This can look very right from an HR’s point of view but every good thing comes at a cost. And the cost which you are bearing is your employees’ health. Keeping up with the hectic schedule, your employees’ often miss out on looking after their health. The heat of this issue is severe and is often felt when faced with serious physical and mental ailments. Employees’ spend most of their waking hours at the office. As a result, illness, weight fluctuations, fatigue are becoming norms of corporate life, meaning more sick leaves and an overall decline in productivity. With companies trying hard to maintain and retain the best of their workforce, corporate wellness programs are now seen as the most viable solution for it. And since the entire world has gone mobile, having a well-crafted employee wellness app can help to ease out your approach towards creating a healthier and productive workforce. The answer is to make employee wellness program a business objective*. *Just like setting goals to improve business like your company’s profit, include employee wellness in the list too. In the end, the wellbeing of an employee reflects back in the face of better productivity and an undoubtful efficiency. Once a target is set, things become more streamlined for an organization to move ahead. Making sure that the employees are taking of their health is a big issue. In order to solve this, corporations often put in place various employee wellness program. But most programs fail to address the issue of wellness in the long run. So if you ask me what is the most feasible way to achieve goals in the long run, then the answer would be creating a habit. Forming habit to achieve long-term goals. Ensuring lasting results for long-term is only possible when the emphasis is on habit formation. You might wonder what habit has to do with an employee wellness program. Every one of us has a habit, good or bad and we tend to stick to it. In the context of an employee wellness program, adopting a healthy way of life on and off work is a plus factor. When employees create a habit within themselves to embrace health activities as a part of their work life, the risk factor leading to various work-life ailments also decreases marginally. Getting employees on board and encouraging them to take up a healthy habit may be cumbersome. However, there are three mantras to achieve it and we applied the same in our corporate fitness app. Triggering your employees to get used to a healthy life involves a lot of effort, but isn’t impossible. 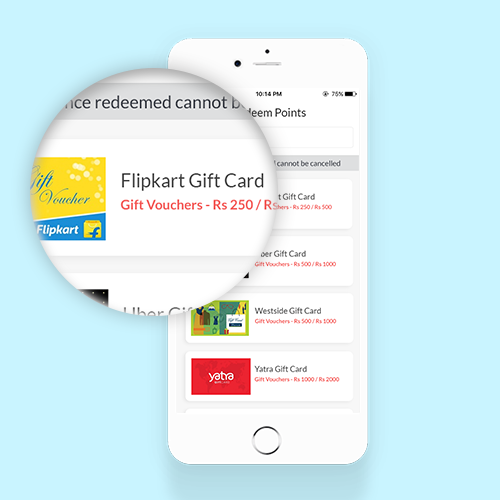 With our customized approach and smooth design of the app, things can flow like a hot knife through butter. First, we try to create health awareness among employees and motivate them with some easily achievable targets. The second element of habit formation is maintaining a routine to keep things running on the track. This is effectively done through constant in-app notifications and alerts. Once, keeping up with a good health becomes a part of the daily routine, there’s no looking back. Third, every good habit adopted has its own rewards to keep things in the loop. Here also we have adopted the same principle. 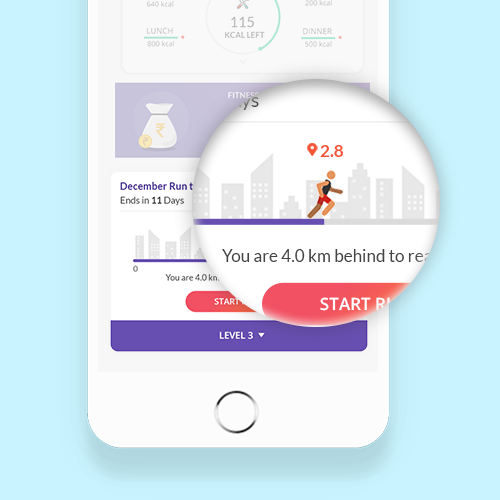 In order to cheer the employees, we have added various in-app rewarding features along with real-time analytics to quantify their health journey. Wait! There still remains a bigger picture for getting the employees hooked. Humans are motivation driven beings and motivation doesn’t come easy. Varying challenges and experiences coupled with the taste of success is the key here. We, humans, have the zeal for moving ahead of one another in every aspect of our lives. Moreover, when a goal is achieved on a social level, one feels more connected and important amongst all the others. The sense of gratification that comes from within after this itself creates a loop. The loop of never-ending motivation releasing dopamine, that drives one to push further and achieve goals much bigger than the previous. Working to bring the same ideology for your employees, we devised a community-driven fitness program within our app. Here all the participants can take part in varying health programs and compete for the top spot in our in-app leaderboard. Likewise, when there’s a motive present that gives one recognition in front of all the others, repetition of the task becomes a routine. All these with one single mobile app, which we created to bring the much-needed change in the corporate wellness scenario. Keeping in mind the needs and aspirations of an employee wellness program, we designed Vantage Fit. 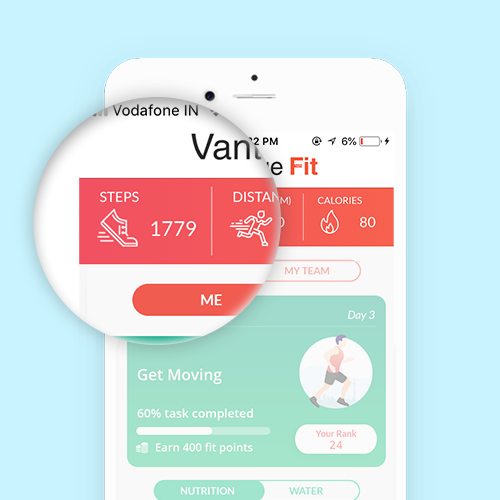 Vantage Fit is a cloud-based mobile application that lets you track, complete challenges, log activities and much more. 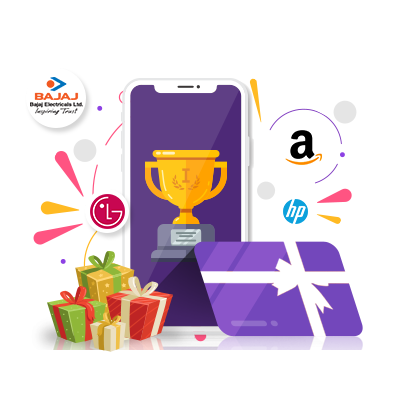 It is an integrated employee wellness program bought by one single mobile application exclusively designed to suit today’s corporate health needs. Why do we call it an integrated employee wellness program? Vantage Fit not only helps incorporate a healthy lifestyle but also emphasizes employee engagement through various in-app tasks and challenges. It makes a perfect choice for employers to address all their employees’ wellness needs. Be it a part of your team activities, or letting them complete health task to get rewards, Vantage Fit is the perfect solution. What makes Vantage Fit Unique? Vantage Fit is much more than a normal fitness or health app. The application has been custom made to fit in well with the modern-day corporate culture. Employees who hardly leave their places while at work, have a hard time embracing healthy activities. These workers are the ones who are hit hard by physical ailments like backaches, joint pains and more. Staying in the same place without any physical movement over long intervals freezes various body functions. Most employee wellness program, like healthcare benefits, on-site health check-ups etc often end up with no effects over an employees health. Vantage Fit solves this issue by emphasizing on habit creation through various in-app activities. These activities include aspects like drinking water, a healthy diet, nutrition management etc. What if the employee isn’t using his/her gym membership? Or skipping health campaigns? From an HR’s perspective, it might be a difficult task to keep a track of all these. At the same time, a waste of money too. Companies taking care of their employees often end up spending a lot over various employee wellness programs. Gym memberships, healthcare perks, insurance covers are very common giveaways across various sectors of today’s economy. However, present-day technology has opened new avenues for cost-cutting across various tangible resources. We believed the same and combined wellbeing with cloud technology making it accessible from anywhere at any time. 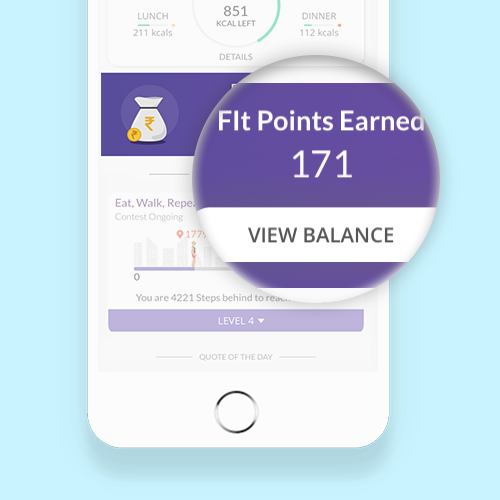 With in-app health activities, Vantage Fit enables employers to track their employees’ health. The wellness app has a unique 12-week health campaign. These campaigns constitute various levels of health aspects like walking, running, yoga, nutritious intake etc. which are indeed very necessary for the human body. Since Vantage Fit is a cloud-based corporate health application, it helps organisations save big in their tangible employee wellness programs. And at the same time, it also helps improve employee health to a great extent. Every champion deserves a reward. Here it’s your employees who have made it through the twelve weeks of rigorous health challenges. They are the real champions. 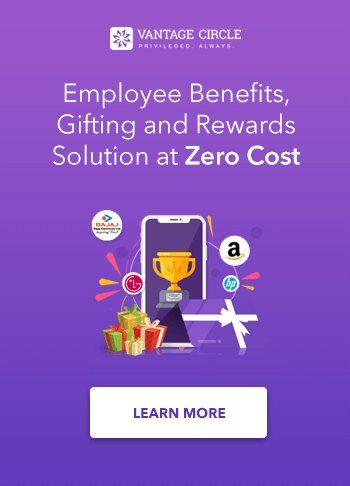 Keeping this very fact in mind, we introduced Vantage Points, an in-app incentivization feature that lets employers reward their employees. These points are given out at the end of each week only if the employee completes the tasks ensuring the most cost-effective way to bring health to your employees. Employees can then easily redeem these points as gift cards from a long list of popular brands and sites. Can you see the benefit here? Instead of giving away gym benefits or any other perk, you can simply engage them in a healthy task and incentivize only if they achieve their goal. A win-win for the employer who is saving up on employee wellness expenses as well as the employees indulged in health activities to earn rewards. The app keeps a track of every step you take throughout the day accurately. It is capable of showing you details brought down to hours every day of your best walk. Also for better physical sync and tracking, the app can integrate with external devices like the Mi Band and other such with more updates in the future. Ensuring a healthy diet is a must for achieving good health. Vantage Fit lets you keep your diet on track with the inbuilt calorie tracker. 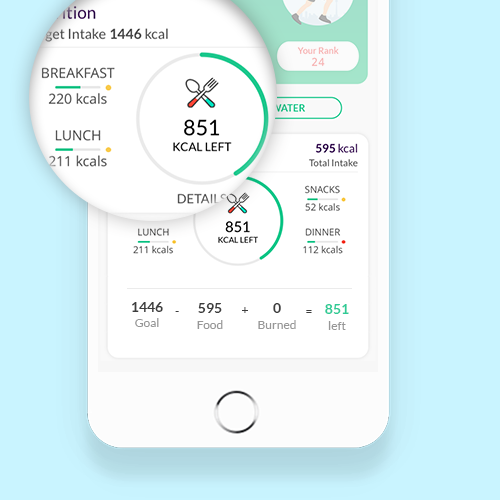 The app takes in all the vital stats of your body before you get started and recommends best calorie intake every day. Together with the Log Meal feature, the app recommends the perfect amount of nutrition needed for every meal. 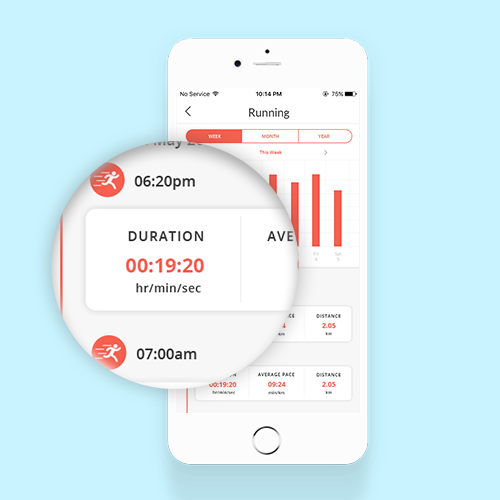 Another added feature of the app is the activity tracker to track all your physical activities in the real-time. You can start activities like walking, running, cycling and keep a better watch on your health. The app also has an added list of a wide range of cardiovascular, workout, sports activities. You can also log in the amount of time spend on various activities and improve your fitness. 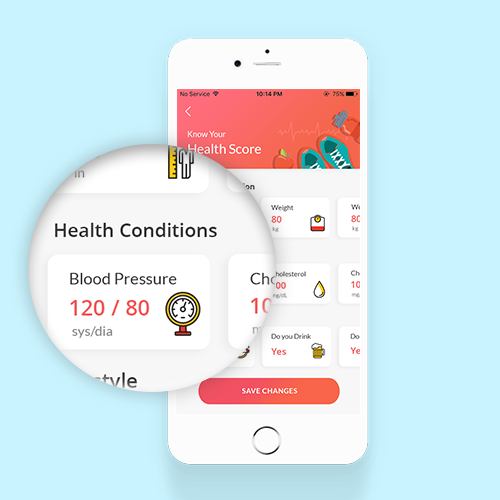 The app lets you create various health contests for the employees. This helps boost the level of sportsmanship among them leading to a healthy work environment. The in-app leaderboard shows the details and the ranks of the leading competitors. This motivates all the other participants to up their game and grab the top spot. Also, you can reward the employees with badges and trophies within the app to cheer up their achievements. Vantage Fit provides the feature for Health Risk Assessment. The app compiles a comprehensive health report for the employee by taking in vital body stats like height, weight, age, blood pressure levels etc. Based on that an employee can easily assess his/her health and take measures to improve it. Also, an employee can set his/her own health goals like Be fitter/Lose Weight/Gain Muscles and the app suggests the best way to achieve it. 7 Minute Workout, Green Score, HeartRate Monitor, MyDiary, Meal and Water intake reminders. 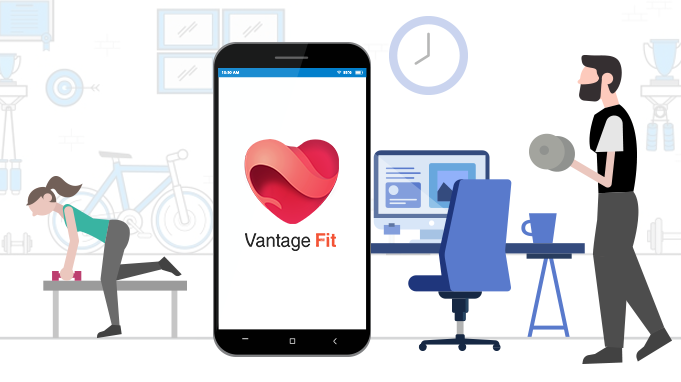 Vantage Fit is a mobile-first employee wellness app which gives an employer full flexibility over their employee wellness program. The employers can promote health in the workplace in the most cost-effective way possible. The app fits in perfect for all sorts of workplaces and the size of the workforce. This indeed makes Vantage Fit the best alternative to conventional ways of ensuring employee wellness. The app will be soon loaded with more features to ensure mental wellness for employees. Because we believe staying healthy is a lot more than just growing muscles. Vantage Fit is available for both Android and iOS platforms. So what are you waiting for? It’s your turn to bring health to your workplace and rise high with enhanced productivity.